If you look at the municipal tennis courts on Cedar Boulevard today, you might have trouble picturing what the space looked like in 1953, when there were three neglected clay courts sporting a crop of weeds. That year, a group of tennis-loving residents decided to remedy the situation by forming the Mt. Lebanon Tennis Players Association. With a goal of creating a better playing environment for themselves and also fostering more interest in tennis communitywide, the association agreed to work with the municipality to operate the courts for five years. Their commitment ushered in the era of modern Mt. Lebanon tennis and resulted in securing money from the municipality to rehab the three courts and build three more. The Recreation Department took over operation and maintenance of the courts in 1959. Five years later the municipality built the tennis center, and by 1966 had expanded to 11 courts, two of which had outdoor lighting, so you could play day or night. So what’s next? How about if you didn’t have to pack away your rackets for six months every year? “The alternative was playing badminton in the gym all winter,” says Tony Waterman, longtime president of Indoor Tennis for Mt. Lebanon. 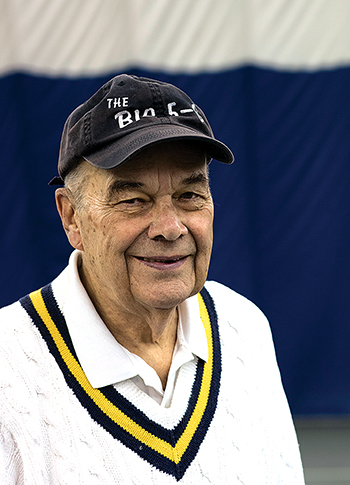 In 1967, Martin Tressel, Paul Tillotson, Frank Wiegand, Tom Halloran and Bob McCallum got together to incorporate Indoor Tennis for Mt. Lebanon. They got 27 other tennis lovers together to pledge $1,000 each for a total of $32,000—equivalent to around $230,000 today—to fund the new operation. In 1967, $32,000 bought a “bubble” that could cover a tennis court, and light and heat that could allow for play year-round. Upkeep would be split between Indoor Tennis, a private entity, and the municipality. 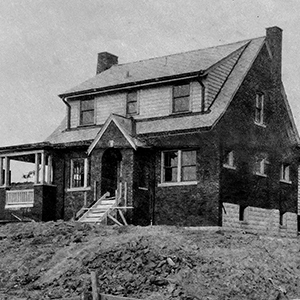 The partnership hit a bump in the road in 1975, when the Mt. Lebanon Commission was planning to terminate the agreement and have the municipality take over the entire operation at the end of that season. Indoor Tennis members managed to convince the commission that the idea could end up costing the municipality money, since Mt. Lebanon would have to assume responsibility of all of the $1,000 notes, which by then amounted to almost $70,000. Also figured into the equation was the cost of hiring additional employees to do the work that Indoor volunteers were doing for free. 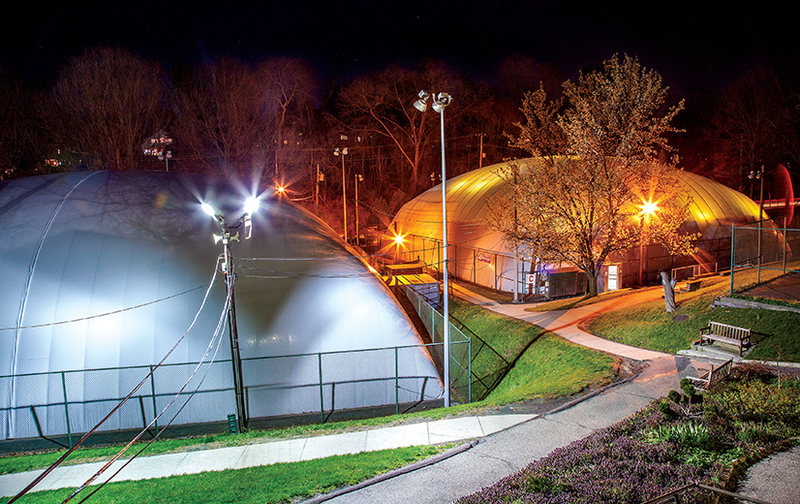 Indoor did borrow money from the municipality on two occasions: $275,000 in 1994 to fund the Tennis Center building, and $250,000 in 2005 to partially fund replacement the old bubbles. Both loans were paid back. 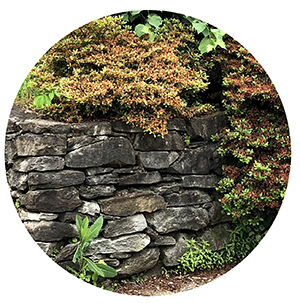 In addition to those two projects, Indoor has spent another $378,500 on improvements, including a rebuild of the courts, new seating and a new stairway and sidewalk improvements for a total of more than $1.3 million over the last 25 years. The courts are covered for half the year, from mid-October to Mid-April. The three bubbles enclose two courts each. Players can rent court time by the hour, at $21 to $31 or full season subscriptions for $545 to $800, depending on time of day and day of the week. So, what’s next for Indoor Tennis? 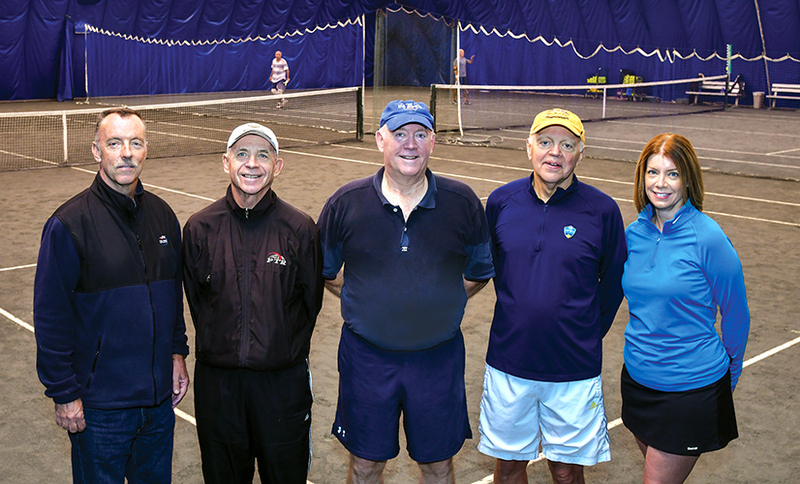 Current Indoor president Walt Henry is, like many of the people who play tennis year-round, an ambassador for the sport. He and others who have purchased blocks of time under the bubbles will share his court time with friends. He says the Har-Tru court surface—a crushed stone composite now used that is similar to but more durable and consistent than clay—is more forgiving for players with ankle, knee, hip and back problems. “I know players who have had hip replacements who play on the courts without any problems,” he says. In addition to providing regular tennis time for longtime friends and competitors, the bubbles are the site of tennis clinics for players of all ages. Indoor also offers high school players some early morning time before school. The public private partnership continues to work well. Henry is quick to praise Recreation Director David Donnellan, Tennis Pro Hank Hughes, Public Works Director Rudy Sukal and all of the municipal employees he has worked with over the years. “They’re all great,” he says. “Very professional, very responsive. A pleasure to work with. Indoor Tennis for Mt. Lebanon is planning a 50th anniversary celebration for September 16 and 17, 2017. Details are still being worked out. Look for more information in mtl as the time approaches.